Does your social media profiles clearly define who you are & what you do? Can your audience look at the profiles and clearly understand what you are portraying? Do you use social media to reach new followers and grow a loyal community? Are you using the same graphic design concept across the different channels? Let’s run through some opportunities that you may be missing when branding yourself using social media marketing. Social media is an important marketing tool that can reach new heights for business or brand.This is a marketing tool that communicates one to one marketing- you can trend, engage and post resources to become an influencer. There are unlimited possibilities when establishing new business relationships, searching for content or ‘listening’ to what users are saying about your brand. It doesn’t take too much time to get the hang of how to use social media if you stay at it – you need to find the right groove by making this a priority for your social media brand. Twitter, Pinterest, Facebook, YouTube, Instagram are just to name a few. Let’s take a step back – What are the differences in each of the social networks & how can your brand use them? Here is a quick guide on the difference between each social media networks. Choose the right network that will support your social media brand. Social media should be about consistency when you are setting the tone of voice to remain professional when crafting posts. I’m going to take you through a walk through on 4 Ways To Brand Yourself On Social Media — some you may already know but others could be opportunities to advance yourself. Let’s talk about branding > Branding can be different elements and concepts that clearly define you, your business or products and services. A brand can be an element such as a symbol that people recognize or a color combination that is used consistently. Users are talking about you online – so show the best side of you when it comes to social media. Take a look at each of your different social media networks – run through each of the areas on the platforms to ensure that content is filled for a full profile. 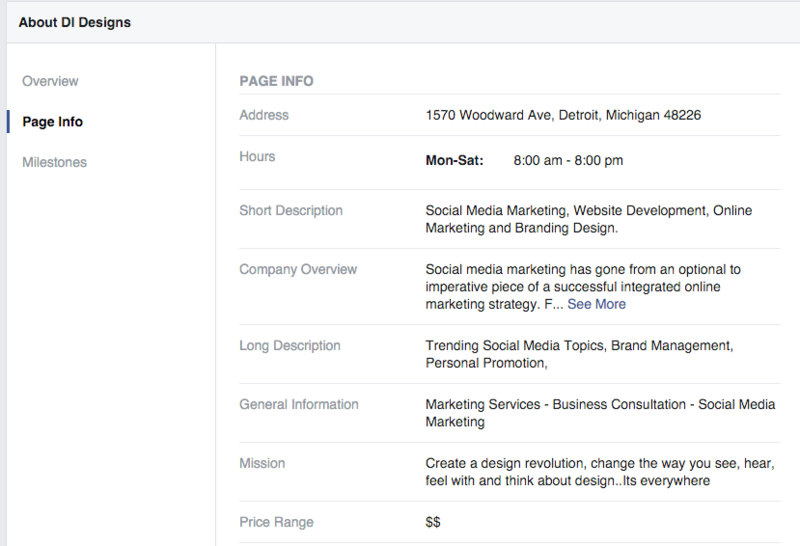 Facebook has different sections that you can complete to be optimized when searching online. You can set the category of your business or brand, list the services you offer, add a webpage / email / phone address and more. Here is a snapshot of my social media consulting Facebook LIKE Page “DI DESIGNS STUDIO” – About Section. Remember to fill in each of these areas for a more full profile on Facebook. 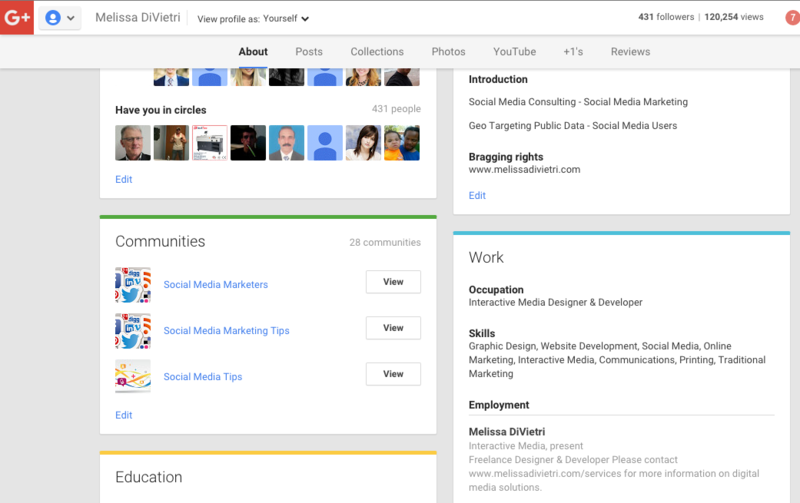 Here’s another example to take advantage of optimizing your social media profile – Google+. You can list the different projects you may be working on, create an introductory and include your education. Twitter & Instagram are different monsters — Since you are limited to 140 characters; you should use hashtags or location to optimize your profiles. Your opening line is what we attract people to reach back to you. Come up with something clever — unique! I’ve added my website in the profile so users can connect with me if interested in what I have to say. These are just small tips to get your profile optimized for better search results. Social media reminds me of when you look at a billboard on the side of a highway. It may take 3 different times until you finally remember what it says before you make an action. Social media can be that same type of flavor. However, you can get past that with a little touch of creative graphics. Profile Image: Use a professional image on your social media networks to show that you are serious about your brand and services. If you use the same profile image on LinkedIn, Twitter or Facebook – users will remember that when they are browsing different networks. Cover Image: This is an opportunity to showcase your creativity.. Step outside of the box and create something fun, unique and eye-catching. I’m a lover of Detroit, MI — my cover image defines that in 2 seconds. I own an office downtown Detroit and work with many industry professionals in the city. When a user lands in your social media network, they should know immediately who you are and what you do – just by looking at the content you publish. The content that you craft should have a clear tone of voice that is consistent. Each social media network requires unique style of messaging because users take different actions. Twitter allows 140 characters to get your message across. This is your opportunity to create a style of tone that is actionable – whether you are witty, using hashtags, directing a website link or more. Every single piece of content should support your brand image. Think about creating useful content that users will share to gain visibility to your networks. Don’t be afraid to use images or video. 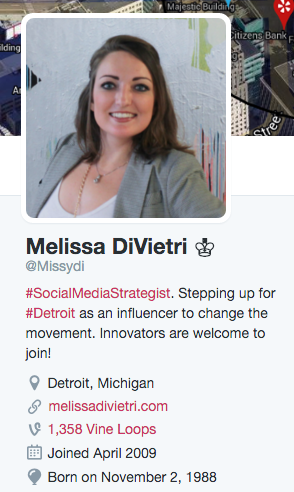 If you land on my Twitter profile @missydi – you will see the majority of the tweets are about social media marketing tips, tactics or programs. Facebook gives you more characters to work with when messaging. You can ask a question, tell a short story or discuss a tip / trick about your industry. I enjoy using Facebook to “boost” posts to reach more followers. Social media listening is a powerful way to grow your network while understanding what people are saying about your brand. You can set different alerts to tell you what users are saying about you.. it’s important to respond in real time whether the comments are network or positive. Social media listening can improve your social strategy because you will understand what users like to engage. Here is a quick demo on how to take advantage of what people are saying with social media listening tools. Still need some more help with your social media brand? Create an audit in regards to your content. List the different social media posts, how many shares and comments. This will give you an idea on what clearly defines your social media strategy. You can utilize this audit to understand your brand. Here are some ideas on what to include in a social media audit. Social media will allow you to directly connect with users. Whether you want to sell your products or services, gain new following or point users in a direction for resources. You can increase your following by creating engaging content through active distribution. User social media scheduling tools to automate your posts ahead of time.